For more details, see this video. For decades, hydrogen fuel cells were a thing of science fiction. However, with the arrival of fuel cell forklifts and new fuel cell vehicles (FCV)—such as the Toyota Mirai—the ultra-low emission technology is on the brink of mainstream adoption. Fuel cell technology is so close to large-scale commercialization that it requires widespread support of a hydrogen supply and refueling infrastructure. While most cars on the market run on gasoline, diesel, or electricity, FCVs are fueled with hydrogen. For FCVs to become common-place, there needs to be a lot more hydrogen fueling stations, a local liquid hydrogen supply, and an economical solution for distributing hydrogen to the stations. To become a liquid, hydrogen—the most abundant element in the universe—needs to be cooled to ~20 K (-253 °C/-423 °F). Current methods use an energy intensive, multi-stage process of compressing and expanding hydrogen gas until it liquefies. A novel approach based on magnetocaloric refrigeration is being developed by PNNL, Emerald Energy NW, LLC, and AMES Laboratory. This new approach could replace the entire process and reduce the cost of liquefying hydrogen by 25 percent or more. A system designed by PNNL uses the magnetocaloric effect to generate temperatures cold enough to liquefy gases at room temperature. The project is part of an effort to reduce the cost of liquefying hydrogen for fuel cells. The system works by taking advantage of a physical phenomenon called the magnetocaloric effect. A certain class of materials—ferromagnets, such as gadolinium—will heat up when subjected to a magnetic field, then cool down when removed from the magnetic field. 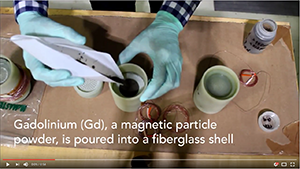 In the PNNL system, small gadolinium spheres are contained in a fiberglass shell shaped like a piston, which moves the material in and out of a strong magnetic field created by superconducting magnets. Under controlled conditions, when the gadolinium moves into a magnetic field its temperature increases. Helium gas is then pushed through the porous gadolinium to remove the heat and expel it. When the gadolinium is removed from the magnetic field it rapidly cools. Helium gas is again pumped through the spheres, transferring heat to the cold gadolinium and flowing past a heat exchanger containing the process gas to be liquefied. The chilled helium “cools” the process gas. The cooling cycle is repeated until the target gas is cold enough to change to a liquid. Funded by DOE’s Energy Efficiency and Renewable Energy’s Fuel Cell Technologies Office, PNNL’s system is significant for three reasons: it requires no separate means of pre-cooling the gas to be liquefied; it achieves an optimum temperature span for each magnetic refrigerant; and, it is projected to require up to 87 percent less gadolinium and other magnetocaloric materials than other proposed magnetocaloric liquefaction designs. 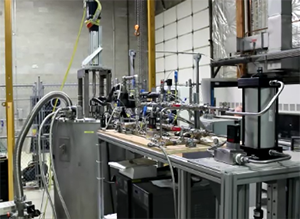 Recently, PNNL successfully liquefied propane starting at room temperature. The next stages of the project aim to increase the temperature span to reach temperatures cold enough to liquefy hydrogen. If successful, PNNL predicts the technology would increase energy efficiency by up to 50 percent compared to current hydrogen liquefaction plants, possibly making this new high-efficiency refrigerator an enabling force for the liquid hydrogen and FCV industry.